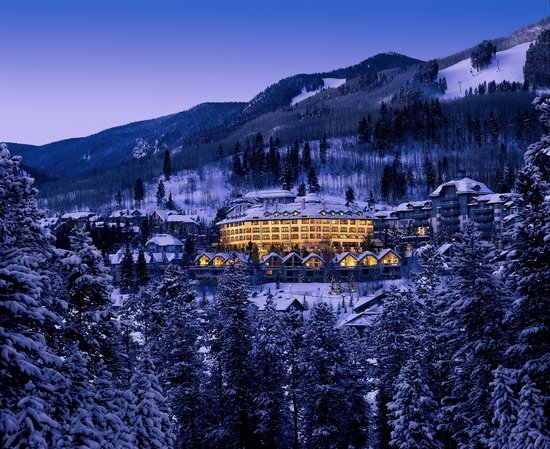 Nestled among four acres of aspen and pine trees, with breathtaking views of the Beaver Creek Valley, this 60-room boutique hotel perfectly blends a rustic and cozy ambience with luxurious amenities. If you’re looking for a high-end ski chalet where you can enjoy the natural surroundings, this ski-in/ski-out lodge is a perfect choice. There’s no kids club here, but a heated pool, Jacuzzi and onsite ski rental shop still make this a good option for luxury-loving families. The Pines Lodge is all about personal service. As you drive up, valets will help you unload and store your ski equipment. The concierge will arrange airport transfers or a complimentary shuttle ride to a nearby restaurant. They’re also happy to order groceries and have them waiting for you upon arrival. Staying in one of the Pines’ condos or townhomes with a wood-burning fireplace? Staff will be happy to start the fire for you each night. Whatever you need, they’re there to help. It’s that kind of hotel. Walk into the stylish, yet cozy lobby (completely renovated in 2013) and you’ll instantly be warmed and welcomed by the three-sided fireplace. During the winter, when you return from the slopes, fresh-baked chocolate chip cookies, hot chocolate and tea will be there to greet you. 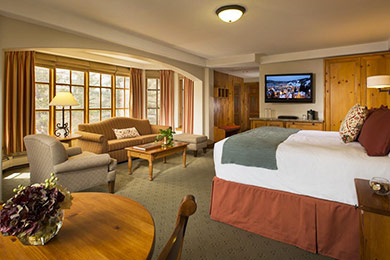 Cozy luxury — think Alpine chic, rather than cabin kitsch — is what surrounds you at The Pines Lodge. 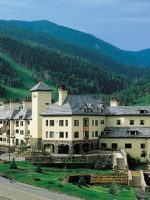 If you’re here to ski, you’ll be glad to see the hotel is only 150 yards from the Strawberry Park ski lift and the charming Beaver Creek Village. At the end of the day, put your gear in a ski storage area, complete with boot warmers, in your room. 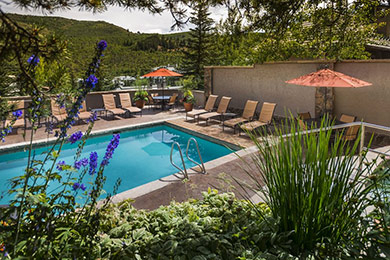 Then take a dip in the outdoor heated pool and hot tub, perched high above the Beaver Creek Valley, and soak in the stunning mountain scenery. The Pines Lodge is a RockResort, and appropriately honors the legacy of its founder, conservationist Laurance Rockefeller, whose aim was to build luxury resorts in spectacular natural settings. Bordered by the White River National Forest, it’s a nature lover’s paradise that’ll likely leave you with a Rocky Mountain high, yet guests get to appreciate modern amenities like luxury bathrooms and high-speed, complimentary Wi-Fi. If you’re looking to escape to the mountains, yet still enjoy the finer things in life, this rustic-luxe hotel is a great choice. Accommodations range from 500-square-foot standard rooms to three-bedroom condos and townhomes. Decorated with -- you guessed it -- pine, the lodge features artistic alpine touches, including wildflowers painted on the guestroom doors, handmade furnishings and a pinecone "Do Not Disturb" sign. Yet, the hotel never takes the Alpine theme too far, just enough for you to remember you're in a mountain setting. 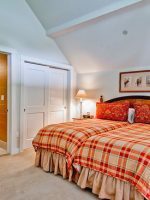 All lodging options have flat-screen TV's, iPod docking stations, ski-boot warmers, luxury marble bathrooms, plush bathrobes and complimentary toiletries, coffee makers, bottled water, ironing boards and iron, hairdryers and daily newspapers. Mini-fridges in the hotel rooms are available upon request. Standard Rooms have either one king or two queen beds and a Juliet balcony. Superior rooms are a bit more spacious and elegant, and also have a Juliet balcony. The six Deluxe Rooms feature one king or two queens, plus either a large sitting area or balcony to enjoy the outdoors. In the eight King Corner Rooms, you'll also find a sleeper sofa, and some of the most picturesque views in the hotel, along with a balcony. Insider's Tip: the even-numbered rooms have the better views. Condos and townhomes are the most spacious option, with full, gourmet kitchens and washers and dryers. The condos all have three bedrooms and three baths, except for a single one-bedroom unit that also has a loft. All condos are two-story units, decorated by professionals according to the owners' taste. Condos are in the main lodge, but the townhomes are about 50 yards away, or a one-minute walk. Townhomes all have three bedrooms and three baths, laid out on three levels. All condos and townhomes have large wood-burning fireplaces, unlike the hotel rooms, which do not have fireplaces. In addition, townhomes have outdoor patios and grills. Plenty of connecting rooms throughout the hotel mean there are lots of options for large families, multi-generational groups or families traveling together. Another family-friendly perk? Kids under age 12 stay free and complimentary cribs and Pack 'N Plays are also available. This place is good, however it is far from great. Where I feel this place is really let down is by its staff. It lacks personality, a friendly helpful face. They didn’t tell us anything on check in....like the fact you can get yummy Starbucks coffee each morning at the end of the hall. Or that there is hot chocolate and cookies each afternoon in the reception area. They didn’t even tell us where the pool and hot tub is or more importantly where the boot warmer room is or even how to get to the slopes! The lodge itself is nice. I felt it was a bit dated. The bathrooms were really dated. Its location is ok. Thankfully the on call Beaver Creek shuttles make up for the fact it’s a bit of a walk into the town centre. It is a bit of a hike to the closest lift (strawberry). Okay as a couple bit with kids this would be a deal breaker for me, just too far. Ski in is excellent. We chose the Pines Lodge for our 10 year wedding anniversary (which I told them on check in) and not once did they acknowledge it...as the title says, this place lacks personality. I really do not understand the 5 star reviews, for the price we paid I expected so much more. Everything at best was average and you expect more considering the price of a room. To call the Lodge Ski in Ski out is a big stretch, a better description is walk in walk out. It is not close to the shops or restaurants and our room had a "beautiful" view of the entrance to the hotel and all the noise that went along with that. They did have free coffee on each floor, nice touch, however there was never any available when we wanted some and that meant searching each floor to see who had coffee. The one redeeming feature of this hotel was the restaurant which was excellent and raised my rating of the hotel from 2 to 3 stars. If you're looking for a fresh-air getaway that's still close to the action, you won't be disappointed with the Pines Lodge. 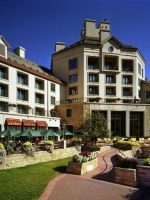 During ski season, the hotel is only 150 yards from the Strawberry Park ski lift and the charming Beaver Creek Village. Don't want to schlep your (and your child's) gear from the hotel to the slopes? Not to worry! Call downstairs and the hotel shuttle will be waiting to whisk you over to the lift. Escalators throughout Beaver Creek Village mean fewer stairs to climb with ski boots on. Parents who've had to carry their kid's equipment, or possibly even a ski boot-clad child, will be applauding this convenience. The village's ice skating rink is another fun spot for exercise in the winter or just to watch one of the frequent ice-skating shows. Monday nights are disco-skate night at the rink. Pretty groovy, huh? 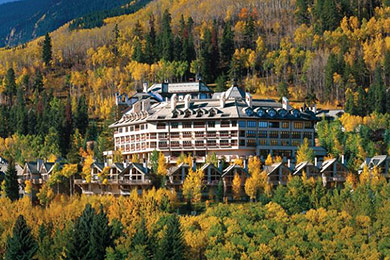 Beaver Creek Village is known for its many kid-friendly events. During your visit, you'll likely encounter anything from a kids carnival to themed characters or jugglers roaming the ski village. Another dynamite perk is the Thursday night fireworks display. Good fun can also be had at the nearby Haymaker Tubing Hill. You can take the Buckaroo Gondola up for free if you're tubing. 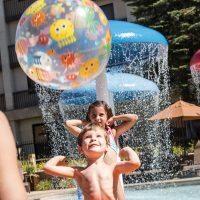 The hotel's outdoor pool and hot tub are also great for families. Perched high above Beaver Creek Valley, guests enjoy soaking in the views while relaxing in the hot tub at the end of their ski day. The pool and hot tub are open from 6 a.m. to 10 p.m. Although there isn't an arcade, the hotel recently added a family game room. Resembling what the family room in your own home might look like, it has two computers, plenty of board games and a large flat-screen TV with a Wii gaming system and a selection of DVD's. There also isn't a kids club, but the front desk will gladly set up babysitting through a service that charges $25 per hour for sitters who are CPR certified and background checked. However, there's a four-hour minimum. It's a bit steep but does allow mom and dad a romantic night out during the trip. Spring, summer and fall bring a whole other set of activities, like whitewater rafting, mountain biking or horseback riding. Just walk out the door and take a hike through the White River National Forest or tee off at the Greg Norman designed Red Sky Golf Club or the 18-hole Beaver Creek Golf Club. 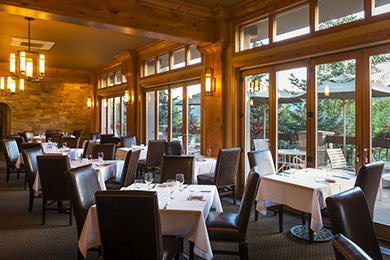 The hotel's onsite Grouse Mountain Grill is upscale, Colorado-centric dining with stunning mountain views. The restaurant's award-winning chef serves up farm-to-table cuisine, highlighting local gardens and ranches. Everything on the menu is made from scratch, from the bread to the desserts. Grouse Mountain Grille serves breakfast and dinner, as well as an afternoon tea service, in an elegant setting with white linen tablecloths. The breakfast buffet is $19 for adults, $14 for kids ages 5 to 12 and kids 4 and under eat free. Kid-friendly dinner menu options include cheeseburgers ($19), fettuccini ($16) and chicken breast ($17.50). True, it's a bit pricey, but this is Beaver Creek. High chairs and booster seats are available. Guests can also choose to just order a glass of wine and drink in the views from the floor-to-ceiling windows looking down at the Beaver Creek Valley, or cozy up by the fire for an apres-ski break. The restaurant also offers a limited room-service menu. Kids of all ages will enjoy the hotel's complimentary family-friendly apres-ski treat of chocolate chip cookies, hot chocolate and tea, offered in the lobby every afternoon. Complimentary coffee is brewed every morning and available by the elevators on each floor. There's a complimentary fitness center with a good variety of equipment. Stay at the hotel during the first few weeks of December and you'll likely be working out with the U.S. Ski Team. The Pines Lodge hosts the U.S. Ski Team each year during the Birds of Prey downhill race. Not surprisingly, they can often be found in the exercise room! There's no spa, but the concierge will gladly set up an in-room spa treatment. 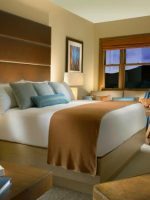 Although it's a treat to retreat to the mountains, you'll be glad to know Wi-Fi is complimentary throughout the hotel and guestrooms. The family room and business center offers complimentary use of computers and a printer, and the front desk will send faxes upon request. Guests in standard rooms have access to the complimentary third floor washer and dryer with free soap. Dogs are welcome in a few of the guestrooms for an additional $50 per night. Eagle County/Vail Airport is 30 minutes from Beaver Creek Mountain. Although Eagle County/Vail Airport is a regional airport, it serves many major cities. Currently, Eagle Airport has direct flights to Atlanta, Chicago, Dallas, Miami, Houston, Los Angeles, Minneapolis, New York, Newark and Toronto. Eagle County/Vail Airport promotions, like the Fly-In/Ski-Free deal, in which you ski for free on the day of your arrival, are a budget-friendly perk. Denver International Airport, a two-hour scenic drive east of the Beaver Creek area, offers a larger selection of daily flights. Rental car agencies are plentiful. However, parking in Beaver Creek is not. It's best to leave the car at the Pines Lodge and take the hotel's free shuttle, which will take you to the slopes or out at night to any nearby restaurants or bars. The shuttle runs until midnight. Parking is included in the daily resort fee. If you'd rather not rent a car, Colorado Mountain Express offers shuttle service from both Denver and Eagle County/Vail Airports. It's $51 per person each way to Eagle. Another budget-friendly option for families is MPG Express. Up to six people can ride in one of their SUV's for $198 one way from Eagle County/Vail Airport and $498 one way for a ride to and from Denver International Airport. Mid-December through spring break is high season in the Beaver Creek area. Kid-friendly festivals are offered throughout the winter in Beaver Creek Village, making this ski resort a favorite for families. WinterFest kicks off the holidays with a gingerbread competition, along with a legendary chocolate chip cookie contest. PrezFest makes for a fun-filled Presidents Day weekend, with costumed Uncle Sams and contests where kids get to be President for the day. March brings SpringFest and the realization that your spring break is not what it once was! Now, spring break involves kids parades and story times -- a far more wholesome scene than the old college days. Any time of year, though, is a good time to visit the mountains of Colorado. The surrounding aspen trees mean that fall brings a vibrant spectacle of color. Spring has warm enough temperatures for biking and hiking, while summer temperatures never get too hot, perfect for rafting, kayaking and mountain biking. A fireside table at the hotel's Grouse Mountain Grill is a lovely spot for a romantic meal. Grouse Mountain's well known for its innovative farm-to-table cuisine. Try the local kale salad, followed by the pretzel crusted pork chops, bison short ribs or Colorado striped bass.